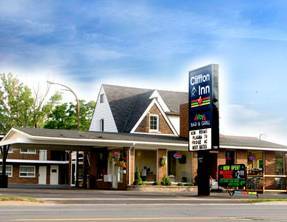 The Cliffton Inn Motel is a year round boutique motel in Niagara Falls Canada. The motel is situated on the family affordable and tourist attraction of Lundy’s Lane, only minutes away from the legendary Niagara Falls. The Casino Niagara, Marineland, and golf just are all located near the Cliffton Inn. This Niagara Falls Motel is within walking distance to the Canada One Factory Outlet Mall, amusement for the children and all the fabulous restaurants that Niagara has to offer. The facilities on the motels property, including dining and recreational areas, are suitable for couples, families and groups. The restaurant and bar on site has a wide variety of food and beverages available for reasonable prices, with flexible hours. Breakfast is included in our room rates. The Cliffton Inn is located 3 km away from the Horseshoe Falls, Clifton Hill, and Fallsview Casino Resort. The motel features a restaurant and a bar, which serve breakfast, lunch, dinner, and a late-night menu. In addition to complimentary wireless Internet access, the property offers a picnic area and a family-friendly environment. Guests have free parking and wheelchair access is also available. All rooms at the Cliffton Inn are spacious, newly renovated and equipped with all the necessary amenities to meet your every need. They are clean and comfortable at affordable prices, from jaccuzi rooms to kitchenettes. Visit us and relax, away from the stresses of everyday life. The staff at Cliffton Inn pride themselves in making your stay a most pleasurable one, and experiencing comfort as being in your own home. This family friendly restaurant located in the motel serves breakfast, lunch, and dinner. For adults a bar and a late-night menu. Indoor and outdoor dining available.